This article is about the number. For other uses, see 35 (disambiguation). 35 (thirty-five) is the natural number following 34 and preceding 36. 35 is the sum of the first five triangular numbers, making it a tetrahedral number. 35 is the number of ways that three things can be selected from a set of seven unique things also known as the "combination of seven things taken three at a time". 35 is a centered cube number, a pentagonal number and a pentatope number. 35 is a highly cototient number, since there are more solutions to the equation x − φ(x) = 35 than there are for any other integers below it except 1. 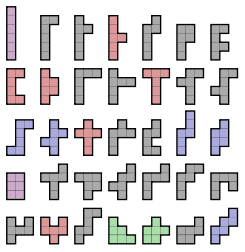 There are 35 free hexominoes, the polyominoes made from six squares. Since the greatest prime factor of 352 + 1 = 1226 is 613, which is obviously more than 35 twice, 35 is a Størmer number. 35 is a discrete semiprime (or biprime) (5 × 7); the tenth, and the first with 5 as the lowest non-unitary factor. The aliquot sum of 35 is 13 this being the second composite number with such an aliquot sum; the first being the cube 27. 35 is the last member of the first triple cluster of semiprimes 33, 34, 35. The second such triple discrete semiprime cluster is 85, 86, 87. 35 is the highest number one can count to on one's fingers using base 6. ^ "Sloane's A005898 : Centered cube numbers". The On-Line Encyclopedia of Integer Sequences. OEIS Foundation. Retrieved 2016-05-31. ^ "Sloane's A000326 : Pentagonal numbers". The On-Line Encyclopedia of Integer Sequences. OEIS Foundation. Retrieved 2016-05-31. ^ "Sloane's A000332 : Binomial coefficient binomial(n,4) = n*(n-1)*(n-2)*(n-3)/24". The On-Line Encyclopedia of Integer Sequences. OEIS Foundation. Retrieved 2016-05-31. ^ "Sloane's A100827 : Highly cototient numbers". The On-Line Encyclopedia of Integer Sequences. OEIS Foundation. Retrieved 2016-05-31. ^ "Sloane's A005528 : Størmer numbers". The On-Line Encyclopedia of Integer Sequences. OEIS Foundation. Retrieved 2016-05-31.